We had our first snowstorm!!! About ten inches total!!! In case those exclamation points didn't clue you in, I must confess I adore snow. I love to make snow men and snow angels and I think sledding is divine. Unfortunately I’ve had a nasty head and chest cold for the past four days and with so much to do to get ready for Christmas, there just wasn't a free moment for any outdoor play this time around. I stayed home with our two youngest kids and granddaughter and cooked some treats to warm the gang when they got home. Knowing they endured snow, rain and chilling winds, I met them at the door with some “Gloucester Grog,” made with apple cider mulled with spices and beach plums and spiked with bourbon. For dinner, I wanted to make a nice homemade soup. One of KG’s friends at work has a fisherman husband who gave us a whole cod, so I decided to make Zuppa di Pesce or Italian fish soup. Paired with some homemade bread, it was just what my cold and weary Patriots fans needed. Heat olive oil in Dutch oven. Add onions, peppers, celery, garlic, and carrots and cook over medium heat, stirring frequently until just tender. Add white wine and cook down until liquid is about half. Add tomatoes and chicken broth and spices and simmer for 45 minutes. Add chopped kale and simmer for 20 minutes or until kale is tender. Add water or more chicken broth if liquid level seems too low for soup or to cover seafood. Place cut up pieces of cod on top of soup and gently push them down to submerge them. Cook for five minutes and then add shrimp. Cook until fish flakes and shrimp is pink, about four or five more minutes. Serve with fresh grated Romano cheese. The soup looks absolutely delicious! Love all the snow! That is a fabulous snowman. 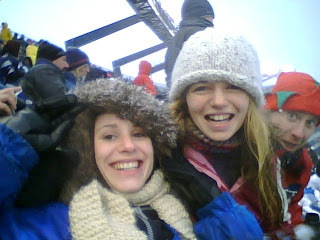 Oh gosh I saw the crowds at the sunday Pats game--they all looked so cold!! I would never have been able to handle that! Yeah they looked cold, but almost every single person had such great tema spirit. That's one of the many things I love about Mass. If I don't talk to you again, Merry Christmas sweetie!